Strainsert, a premier manufacturer of standard and custom force sensors for research, testing, weighing and control applications in the Aerospace, Military, Marine and Automotive industries, is proud to announce their engineering staff earned a Special Achievement Award from NASA’s Capsule Parachute Assembly System (CPAS) Team. The award recognizes vital assistance in conceiving, designing and testing custom force sensors used in the successful CPAS-EDU-CDT-3-16 airdrop test. Strainsert enjoys working with NASA and is proud of our engineering staff being recognized for their stellar work on this project with the CPAS team. 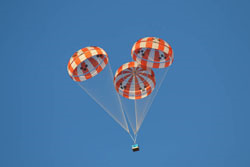 The Capsule Parachute Assembly System (CPAS) Team has given a Special Achievement Award to the Strainsert Company, to recognize their efforts to develop a force sensor to collect textile riser load measurements during engineering development for use on qualification airdrop testing, spaceflight testing and human spaceflights. Drogue and main parachute riser loads are critical measurements collected during CPAS airdrop tests. Riser design changes from steel to textile required a complete revision of how these loads could be measured. Two COTS solutions were attempted, neither of which collected usable data. Strainsert helped conceive, design and test custom force sensors (http://www.strainsert.com/applications/aerospace-load-cell-applications/) which successfully collected parachute riser load data on the CPAS-EDU-CDT-3-16 airdrop test conducted in August 2015. This successful instrumentation demonstration cleared a serious threat to the upcoming CPAS qualification testing and will enable load measurements to be taken on future spaceflight tests and human spaceflights. The CPAS team is developing the parachutes for Orion, which is NASA’s spacecraft that will send humans to deep space destinations on missions beyond the moon and bring them home safely. “Strainsert enjoys working with NASA and the challenging programs they provide us”, Strainsert’s President Tim Foley stated recently, “and is proud of our engineering staff being recognized for their stellar work on this project with the CPAS team”.